With all that energy shining down on Earth, we only harvest a tiny quantity of it. We use large arrays of solar panels to collect what we can, but this is still supplemented with fossil fuels, adding to carbon emissions. Solar technology is advancing and newer, more efficient photovoltaic cells are now beginning to appear. Current solar power systems are great for providing energy to heat homes and power lights and energy efficient appliances. Some systems are limited in the amount of power they can collect, so generating enough power to cook food would require large solar arrays. Not a problem if you live in an area that has a lot of exposed sunlight to collect, but cloudy days, mountain or tree coverage, and far northern latitudes can all contribute to poor solar collection. Professor Ole Jørgen from the Department of Energy and Process Engineering at the Norwegian University of Science and Technology (NTNU) has developed an integrated solar stove and energy storage system for use in cabins and homes. The NTNU notes that conventional batteries lack the capacity to hold enough energy to heat food, approximately 200 °C (400 °F). Jørgen and a team from the Ethiopian Institute of Technology approached this idea from a different perspective. Instead of capturing the solar radiation and converting it into electricity, they developed heat sink technology. The boiler could store temperatures in excess of 200 °C that could be used as either an oven, or a heating element for personal living areas. 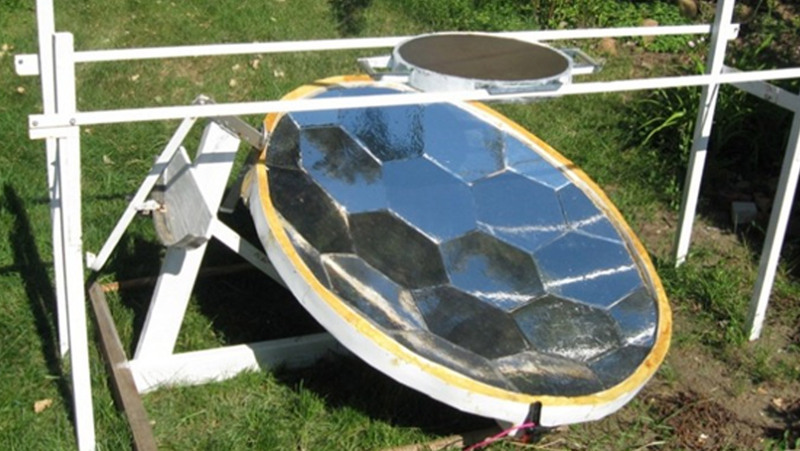 The Sun’s heat has frequently been harvested by using solar concentrators. Think of holding a magnifying lens over a piece of paper. If you focus the beam correctly, the beam will eventually heat up the paper and cause it to catch on fire. But the NTNU team did not use a concentrator, instead, they opted for converting excess energy collected from wind generators or solar cells into thermal energy. The power generators would feed a battery and once full, the excess power would be converted to thermal energy and deposited into the heat sink. The real innovation of this system was the heat sink itself. The heat battery is composed of a nitrate salt that has a melting point of 220 °C. As the heat is dumped into the sink, the salt becomes a molten liquid. Once the sun goes down, the excess heat is radiated out as the salt solidifies. The unit is insulated to make the heat last through the night. By placing a griddle over the unit, it can be used as a stovetop, perfect for lefser (soft Norwegian flatbread) or Injera (Ethiopian bread). This multifaceted system is perfect for developing countries. Working with Ethiopia, the NTNU team expressed that this system is very sustainable and uses free resources. In Ethiopia, most of the heat and energy come from burning of biomass, with less than 2% coming from electricity. As the country develops its electrical grid, they can recover the obligatory radiant thermal energy using heat sinks, making their energy consumption much more efficient. 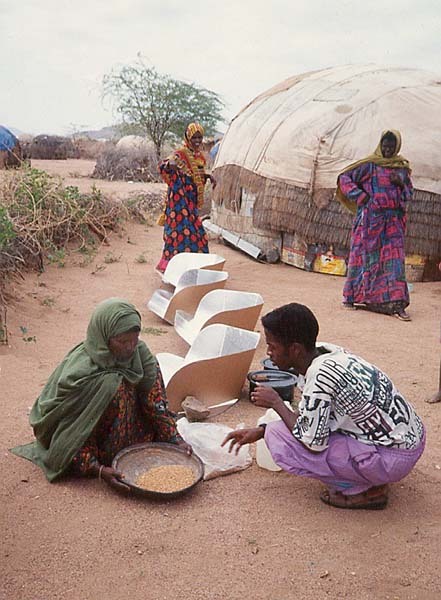 Unlike other solar cookers, this system generates more heat and can be used indoors, which is more convenient for making the traditional breads of the area. There is still a long road before this system can be fully implemented but this system has brought both utility and awareness to an area that previously did not use solar cooking.